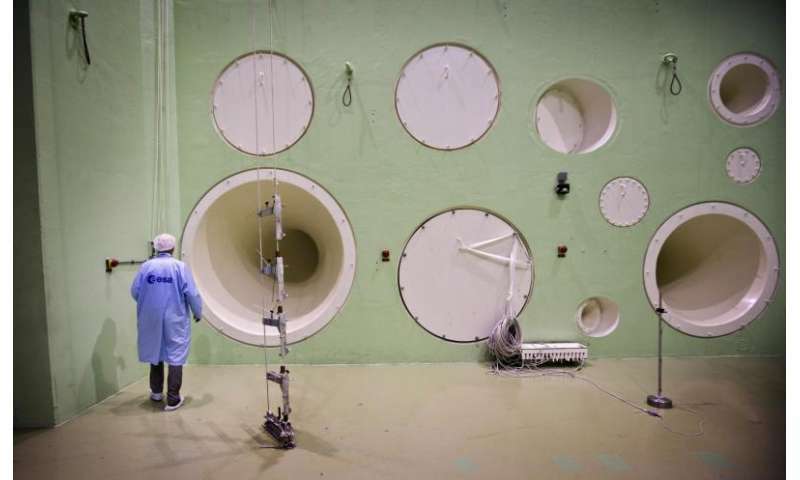 ESA's Large European Acoustic Facility (LEAF) will be on view to visitors at next month's ESA Open Day in the Netherlands, along with other facilities in the establishment's Test Centre. LEAF subjects satellites to the same noise a launcher produces as it takes off and flies through the atmosphere. One wall of the chamber – which stands 11 m wide by 9 m deep and 16.4 m high – is embedded with a set of enormous sound horns. Nitrogen shot through the horns can produce a range of noise up to more than 154 decibels, like standing close to multiple jets taking off. LEAF is an integral part of ESA's Test Centre at ESTEC in Noordwijk, the Netherlands, a collection of spaceflight simulation facilities under a single roof. Following the recent departure of the last of a batch of 22 Galileo satellites, this year's Open Day on Sunday 8 October will feature a tour of key Test Centre facilities.